This element specifies a group shape that represents many shapes grouped together. /// This sample shows how to work with shape groups. // Let's create a document. // Specify the size dimensions of the child extents rectangle. // Create a child shape#1 (inside group) with preset geometry. // Specify shape's size and offset relative to group's ChildSize (100x100). // Specify outline and fill. // Shape will be rectangle. // Create picture and add it into the group. // Specify picture fill mode. // Add shape and picture into our group. // Add our group into the document.
''' 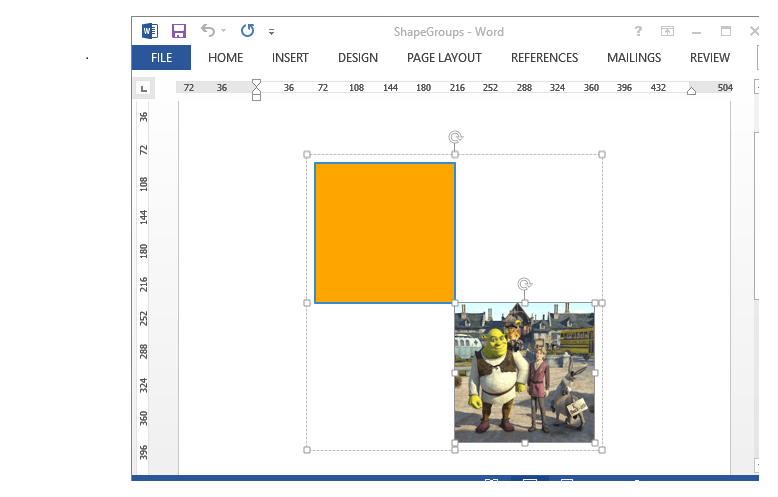 This sample shows how to work with shape groups. Dim documentPath As String = "ShapeGroups.docx"
' Let's create a document.
' Specify the size dimensions of the child extents rectangle.
' Create a child shape#1 (inside group) with preset geometry.
' Specify shape's size and offset relative to group's ChildSize (100x100).
' Specify outline and fill.
' Shape will be rectangle.
' Create picture and add it into the group.
' Specify picture fill mode.
' Add shape and picture into our group.
' Add our group into the document.